The emphasis is on the masses. Trips might seem cheap, but the companies are basing their numbers on quantity, not quality. The emphasis is on the individual. European Focus founder and operator James Derheim puts together tours for singles, couples or small family groups up to 10. We travel in style, using sedans, station wagons or the European Focus company van to accommodate you comfortably. Fewer than 50 carefully chosen travelers will experience the wonders of travel with European Focus this year. That’s compared to more than 14,000 for Rick Steves, and triple that for Globus, Trafalgar and Insight. Profits are maximized by cutting corners. You are oftentimes staying in industrial zones, far away from town or city centers. Meals are planned around cost savings. “Chicken or beef” is usually your choice for dinner. Drinks are never included. There are many “optional” excursions which you have to reach into your pocket to pay for. Tour guides are paid peanuts, and therefore have to subsidize their meager pay by adding “shopping destinations” to the day’s plan. The last person out the door of a shop is the tour guide, collecting anywhere from 10 – 15% of what you just spent. Your tour is more about shopping in order to fill the guide’s pockets. European Focus cares more about your happiness because without it, being the owner and operator of a very small company, James Derheim wouldn’t have a business or a livelihood. We stay in the heart of historic towns, always in small inns and rarely in chain hotels. James and his professional guides are paid a salary, and are never, ever paid a commission by any store they might suggest you check out. You’re lured in by a cheap price for your tour, then hit later by “optional” activities that cost you extra. Your trip cost can easily cost double what the brochure or web site promises. Sometimes the big bus tour companies even charge an extra fee to get you into town from the suburban hotel where you are staying. James Derheim paces your tour at your speed. Want to sleep in and have a leisurely breakfast? Fine. We adjust our itinerary according to your mood. This is impossible with a big group of people, who must be kept on a rigid schedule. James loves to be spontaneous. Want to spend a little more time shopping or sightseeing in a particular town? Great! James can easily adjust and he loves to divert off plan. You may never take another bus tour, after you’ve been on one. James often hears comments like this from our guests: “We took a bus tour once and got a broad overview of Europe, but after a private tour with you, we’ll never go back to that kind of touring. This is so much more relaxed.” Half of the 10 – 15 tours booked each year are with repeat clients. It’s up to you. Save money and go with a big tour company, and possibly regret the choice. Or, spend more, have more flexibility, enjoy the experience thoroughly and come back for seconds, thirds or fourths. If exceptional service, attention and dedication to your happiness is important to you, then come with James for an adventure that will result in a lifetime of memories. 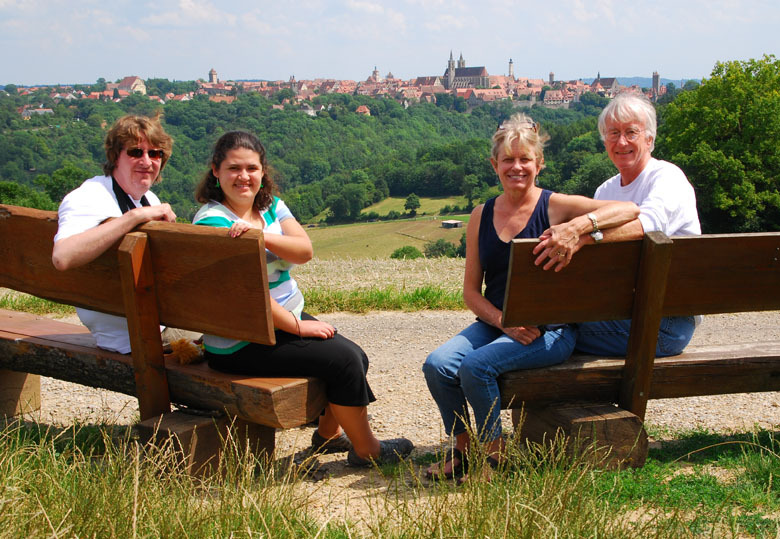 European Focus Private Tours welcomes guests from every walk of life. Continue with the first steps to design your own tour here. Or learn about our featured, planned itinerary tours.